Sunday, November 2nd, 2014 is a day when holidays collide, but I doubt many will notice the irony. Most will be too distracted watching their favorite football team to celebrate either The Day of the Dead or Orphan Sunday. Day of the Dead and All Saints is supposed to be about remembering our departed loved ones. But it is mostly a drinking holiday in the US, a “Mexican Halloween”, with a nod to the culture via displaying sugar skulls. All Saints/All Souls is celebrated in some Western high churches on the first Sunday of November. Both are ancient celebrations, going back to pagan times. Orphan Sunday is a recently contrived holiday, strategically glommed onto the first Sunday in November in many Christian churches as the kick-off of National Adoption Awareness Month. Adoption as we know it is not biblical. God did not create it. It is unnatural. We were spiritually adopted by God so we would be brothers and sisters of Christ; God does not seal records, God does not supply false birth certificates, and God did not call you to take children from their culture and homelands. What started as a noble way to help children is now, in some churches, a gateway to help themselves to children. But that is what Orphan Sunday has become. The first and foremost solution is adoption. Churches promote it. Members will tell you they were “called to adopt” by God himself. The Western, “Christian” version, where children are uprooted from everything they know and expected to become grateful Americans. The irony I find in the joint celebration of The Day of the Dead and Orphan Sunday is that often, the orphans being “saved” through adoption are 1) not really orphans, 2) not better off being adopted, and are 3) sometimes next year’s dead to be remembered. The scripture of Orphan Sunday is Isaiah 1:17 “Learn to do good; seek justice, correct oppression; bring justice to the fatherless, plead the widow’s cause.” And also James 1:27 “Religion that God our Father accepts as pure and faultless is this: to look after orphans and widows in their distress.” Do you see anything about separating children from their mothers? Or taking children from their homelands? Job 24:9 The fatherless child is snatched from the breast; the infant of the poor is seized for a debt. The Adoption Industry rakes in over three billion dollars a year. That money is not going to the “orphans”. It is going to the brokers, the traffickers, the agents. It is the opposite of what God commanded, to “bring justice to the fatherless and look after widows and orphans in their distress.” It is buying and selling human beings under the guise of adoption. Yes, I know many have taken in children as their own believing they were doing good. And I am not saying all adoptive parents are monsters. I am saying: Don’t be taken in by a well-contrived sales pitch. That photo above? It was taken by Bharesh Bisheh, an Iranian photographer. 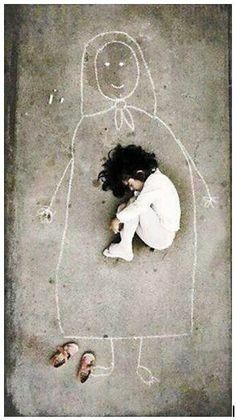 It went viral as an Iraqi orphan who drew her mother in chalk and went to sleep in her “arms”. Heartbreaking, except it’s not true. The child is really the photographer’s cousin, who simply fell asleep while drawing with chalk. There’s no orphanage, no tragedy, no orphan. But how many people clamored to adopt this girl? Hundreds? Thousands? I wonder if any Middle-Eastern children were sold as this girl, to make people believe they were saving her? Like the story often told to adoptive parents of Chinese girls, that she was found in a cardboard box by the side of the road. How many times can a story be recycled before someone finally notices the improbability? Like how adoptees in the 1950s were told their parents died in a car accident, only to discover there was no accident, and their parents were alive. Before you save an orphan, make sure they are, in fact, an orphan in need of saving. Originally written 2014, updated 2017. A pre-emptive strike against Orphan Sunday, which is on Nov 8th this year.